Yes in the round with special guest Donovan. I was there. I had car trouble and my 1971 Oldsmobile Cutlass died on 303 between 271 and the entrance. I pulled it off the road and my date and I walked the rest of the way. I seem to remember "Going for the One" as the first number following the Stravinsky intro. My best seats ever for a major show. Third row, center. When we got Roundabout AND Yours Is No Disgrace after Trooper I thought the frickin' building was going to dissolve. Thanks to God for the internet, because in the decades that have followed I repeatedly talked about the Flight Jam and friends who were AT the show with me couldn't remember it. They thought MY memory was compromised. It was the day after Elvis died. The concert was truly unbelievable. What I will remember most is that after the encore songs, the fans simply wouldn't leave. Everyone stood and cheered....the lighters lit the darkened arena...and the Coliseum overhead lights went on, signalling the end of the concert. No one moved....No one left. The crowd continued to cheer, the lighters continued to burn for what seemed like 5 minutes despite the concert hall lights on full. They wanted us to leave. No one did. The band came back on for a second encore and only after that were the appetites of those special YES fans...me included...whetted completely. Unbelievable!!! This was my introduction to seeing Yes in concert. My friend Jim and his brother Jeff were huge fans and I heard various albums through them. I wasn't as advanced in progressive rock at the time so much of the music went over my head. We sat in the nose bleed section so I really don't recall seeing much. I was spellbound by the music and the more I heard it, the more I became interested. If you're out there somewhere, Jim & Jeff...thanks again! What also stands out in my mind is the fact that Elvis died that day. Donovan (an odd opening act, I thought at the time- being 17)had a moment of silence then played a tribute song "Local Boy Chops Wood" that was rather amazing. The return of Wakeman was spectacular, as was the whole evening. 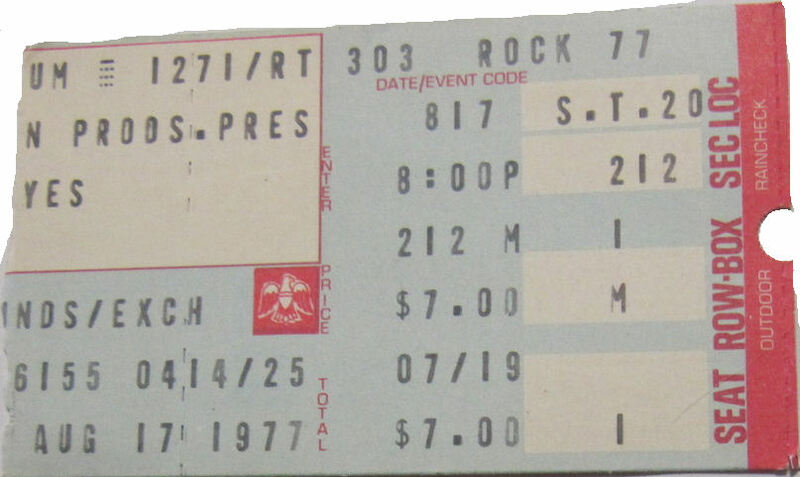 As a side note, my 14 year old son now wears the "Tour 77" T-shirt I purchased that night! We were all excited about the return of Rick Wakeman to the band and quite jittery over what to expect. GFTO was out and I felt at the time the work was a bt uneven. GFTO and Parallels didn't do too much for me and "Turn of the Century" was something of a new twist. The concert changed my mind about all of that though! Jon and Rick's duet on "Turn" was perhaps the MOST magical moments of any Yes concert I saw in the 70's. It was nothing less than superb. I was completeyl amazed that Jon would play an extended acoustic piece (he did switch back and forth between electric and acoustic) in a large hall like that - yet the song retained all of it's wonderful texture and subtly, even in the Richfield Coliseum - at that time the largst indoor venue in the world. I missed "Ritual" but the return of pre-Topographic songs was welcomed in it's stead. "Awaken" was just fantastic. I was glued to Steve's hands during the opening section just after the long intro - the way he bent the strings and slurred the chords during "Awaken, Gentle, Mass, Touch" was wonderful. My memory may be blurred, but I think this was the tour where he wore a silver/gold cape and played barefoot........Wakeman was, well Wakeman. His indelible stamp was quite prominent in this show.